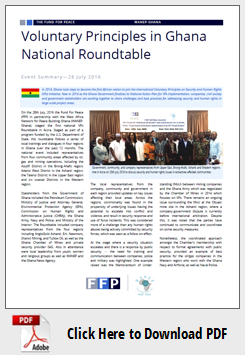 On the 28th July, 2016 the Fund For Peace (FFP) in partnership with the West Africa Network for Peace Building-Ghana (WANEP-Ghana), staged the first national VPs Roundtable in Accra. Staged as part of a program funded by the U.S. Department of State, this roundtable follows a series of local trainings and dialogues in four regions in Ghana over the past 12 months. The national event included representatives from four community areas affected by oil, gas and mining operations, including the Asutifi District in the Brong-Ahafo region, Adansi West District in the Ashanti region, the Talensi District in the Upper East region and six coastal Districts in the Western region. Stakeholders from the Government of Ghana included the Petroleum Commission, Ministry of Justice and Attorney General, Environmental Protection Agency (EPA), Commission on Human Rights and Administrative Justice (CHRAJ), the Ghana Army, Navy and Police, and Ministry of the Interior. The Roundtable included company representatives from the four regions including AngloGold Ashanti, Eni, Newmont, Shanxii Mining, and Tullow Oil, as well as the Ghana Chamber of Mines and private security provider G4S. Also in attendance were local leadership from youth, women and religious groups as well as WANEP and the Ghana News Agency. The local representatives from the company, community and government in each region provided updates on key issues affecting their local areas. Across the regions, commonality was found in the propensity of underlying issues having the potential to escalate into conflict and violence, and result in security response and use of force incidents. This was considered more of a challenge than any human rights abuses being actively committed by security forces, which was seen as a follow-on effect. At the stage where a security situation escalates and there is a response by public security — the need for training and communication between companies, police and military was highlighted. One example raised was the Memorandum of Understanding (MoU) between mining companies and the Ghana Army which was negotiated by the Chamber of Mines in 2014 which focuses on VPs. There remains an ongoing issue surrounding the MoU at the Obuasi mine site in the Ashanti region, where a company-government dispute is currently before international arbitration. Despite this, it was noted that the parties have continued to communicate and coordinate on some security measures. Nonetheless, the coordinated approach amongst the Chamber’s membership with respect to formal agreements with public security, provided an example of best practice for the oil/gas companies in the Western region who work with the Ghana Navy and Airforce, as well as Naval Police. Through sharing experiences of the local issues in extractives-affected communities, stakeholders were able to identify best practices as well as issues which could be supported at a broader national or policy level. While not all the discussion areas were germane to the VPs, there was an understanding that many of these local grievances have the potential to become security issues. Discussion highlighted the need for companies to better engage with communities from the beginning of a project lifecycle, and managing community expectations about employment opportunities, compensation, and livelihoods, as well as security arrangements. With new oil/gas projects coming online in the Western region, community concerns were raised about planning for sustainable livelihoods, including investing in youth skills and education. Similarly, the disputes in the Upper East regarding the company provision of funds for development projects, rather than sums of revenue to traditional leadership, remains ongoing. The community representative from the Brong-Ahafo region shared that one of the successful approaches taken by Newmont at their mine was to create an independent fund which is managed by elected community members to invest in key local projects and initiatives. This has imbued local ownership for the sustainable development in the communities, and provided opportunities for a range of community voices to have a say in how extractives revenues are used, including the youth. The pervasive issue of Galamsey — including illegal mining on and around large mining concessions — was raised in all four regions. As part of the illegal mining trade, Roundtable stakeholders identified impacts of increased criminality, environmental degradation, health and safety concerns, and land disputes that have many adverse effects on communities and companies alike. The public security responses to Galamsey — including police and military deployments to some mining sites — were also raised as a concern. The risk of use of force incidents by public security forces significantly increases when clearing Galamsey operations in an area, especially if the illegal miners are armed with firearms or other weapons. With concerns raised surrounding youth unemployment and disenfranchisement, these also feed into the illegal mining trade. There needs to be continuing government dialogue about policy measures that can seek to address the issue, and create better employment and economic opportunities in Galamsey areas that dis-incentivize illegal mining practices, and encourage local communities to reject the practices. At the other end, there needs to be robust communication between public security, companies and communities about Galamsey and how security arrangements do not create adverse impacts on human rights. A follow-up dialogue in October 2016 will focus on bringing these human rights and security issues into a national policy discussion, with key stakeholders from the Ghana government ministries, companies and civil society. It will also explore how these pillars can support the government’s VPs National Action Plan.